When you think of Real Estate, what do you think of? The search for the perfect property? The right number of beds and baths?An updated kitchen and a fenced in yard? It’s always great to find that place that you can see yourself in, but that’s not all there is to it. We know your search is about more than finding a house; it’s about finding a community. 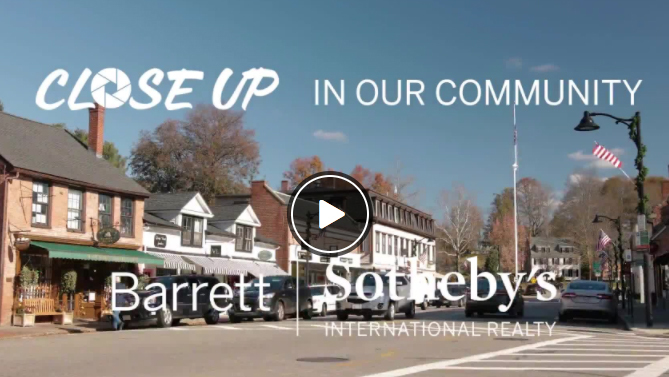 At Barrett Sotheby’s International Realty, our mission is to help you find both, the perfect home in the ideal community. We have always showcased properties to help you find your house, now we are exposing you to some of the local businesses in our vibrant area, so you can get a flavor for what makes our towns so special and how committed the local businesses are to serving their communities. Through the Close Up In Our Community video series, our agents take you with them to visit some of their favorite local places. Check out our Close Up Series page, you may find a new favorite place right in your neighborhood!